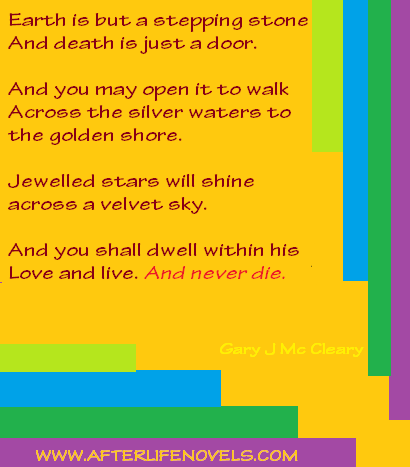 Poem on Life After Life By Gary ! For thousands of years all the worlds religions have been talking about life continuing on after the physical body dies. More than this human beings seem to have it hard wired into their brains that there is a life after death and that there is an Ultimate Being who created everything and everyone. When this concept is looked at logically and with real skepticism many people come to the conclusion that all consciousness ends at physical death however I claim that NO ONE truly believes this at the ‘gut’ level. Even the most hard-nosed skeptic will call out to God for help under the right circumstances. This ‘hard-wiring’ into the human psyche for the need to believe in a Higher Order Being should give us real pause for thought. In fact this is probably the reason that so many people are prepared to believe, on blind faith alone, in ancient books written thousands of years ago and which have undergone any number of translations down through the ages. These same books have also been altered for political reasons of the day and only certain books have been included. Irrespective of the many belief structures that have been invented to explain it down through the ages the ‘after-life’ is none the less very much for real and it has huge consequences for the here and now! My training and expertise is in the area of science and mathematics and I can tell you honestly that I have not come to my present understanding through blind faith or indoctrination but through making a seventeen year study of the various separate areas of evidence that exists for the existence of the afterlife. There are twenty two distinct lines of investigation, all of which if used in a court of law in relation to a crime would be enough to convict someone many times over ‘beyond any reasonable doubt’. Some of these are so powerful and have been done under strict scientific protocols that they are convincing beyond ANY doubt! The Cross Correspondences and the Scole Experiments fall into this later category as do a number of well documented Near Death Experiences which have occurred in real time while the patient was clinically dead on an operating table. If one then adds in other considerations such as Electronic Voice Phenomena, Automatic Writing, Voice and Materialization Medium Ship, Reincarnation evidence, Remote Viewing, Out of Body Experiences, Apparitions and Death Bed Visions, Experiments on Group Consciousness and many others then the conclusion is inescapable. I have collected many examples of this evidence together and I have presented it on my website at www.afterlifenovels.com .In addition I have written eight interesting novels which take this evidence as a backdrop to the stories. All of my characters are very ‘down to earth’ and credible even the non human ones and the stories, while they themselves are fiction, are meant to highlight the very real nature of eternal life and what it means to be a member of a race of powerful eternal beings. 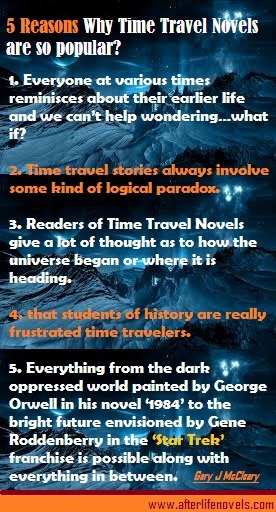 5 Reasons on why Time Travel Stories are Reader’s No.1 Choice? For More Info. on Time Travel Novels Visit Us !